With a week to go my baking has definitely taken a festive turn! 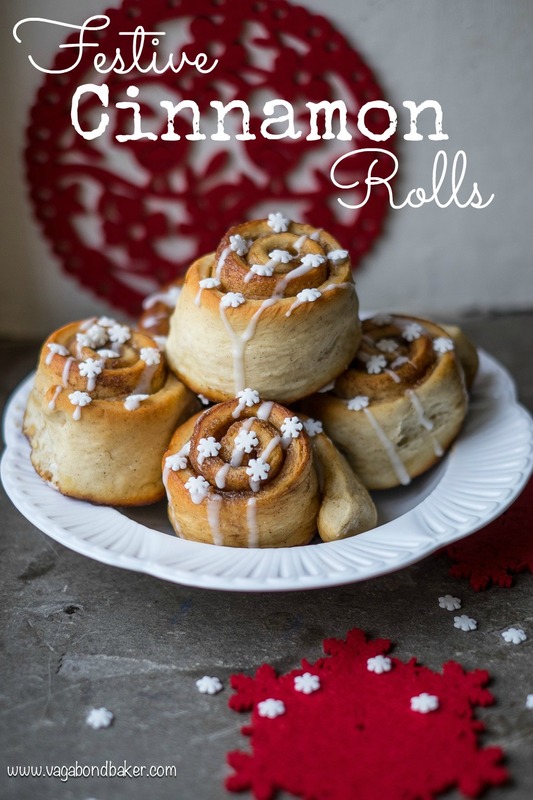 Ok, so these snow-flaked festive cinnamon rolls are simply cinnamon rolls with, er, snow flakes but as I’ve never posted a straight up cinnamon roll recipe I thought I’d share them with you anyway, snowflakes and all. I made a batch and froze half so that I could quickly bake them straight from the freezer if anyone pops round over the next few days while we’re house sitting. It’s our gorgeous regular house sit – as seen in A Day In The Life Of A House Sitter! – and it’s close to Chris’s family and friends, anyone could appear and I’ll be ready! There is an Aga so I love baking bread and bread-type stuff when I’m here. The Aga just bakes them so perfectly. This recipe is basically the same dough and filling as Korvapuusti but with a simpler construction – a basic swirl. I made a simple icing of icing sugar and orange juice, drizzled it and scattered with sugar snowflakes (bought from Tesco, I couldn’t resist them) for a festive twist. They look so pretty don’t you think? The sugar snowflakes give a great crunch, in the same satisfying way as the more traditional pearled sugar only these are added after the baking rather than before. 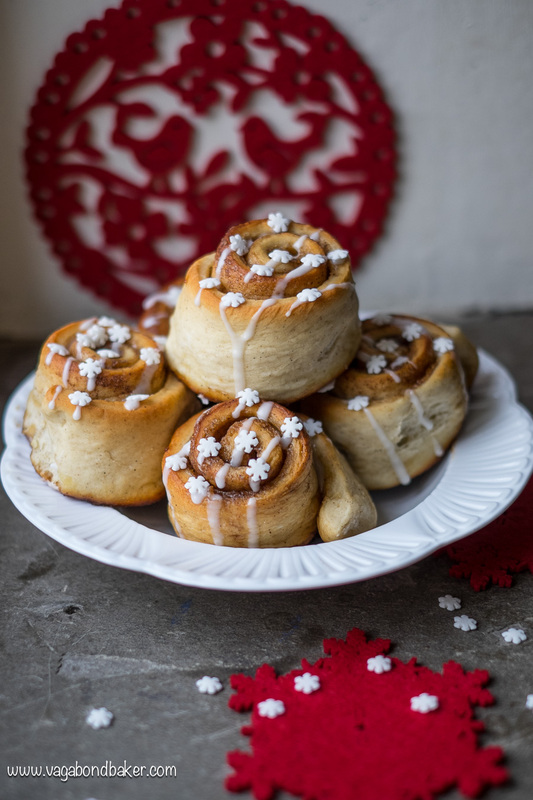 Fill your kitchen with the festive scent of cinnamon, cardamom and fresh bread: when these babies come out of the oven you will be in heaven! Heat the milk to almost boiling point then take off the heat then add the salt and the butter (cut into slices if it is straight out the fridge). The butter will melt into the milk. Place the flour, yeast, ground cardamom and caster sugar into a large bowl and thoroughly mix together: a balloon whisk will do this brilliantly. When the milk/butter has cooled, mix in the egg. Add most of this liquid to the dry ingredients and begin to combine, switching to your hands. You may not need all the liquid depending on the flour and the humidity. Place into a clean bowl, cover with cling or a tea towel and leave to prove for around an hour, it needs to double in size. Leave it somewhere draft-free and not too cold. Prepare a couple of baking sheets by lining with baking parchment. Once the dough has risen, remove from the bowl and roll out quite thinly into a squarish rectangle. It wants to be around 5 mm thick. Cover the rolled out dough with the soft butter, spreading it out evenly with the back of a metal spoon, or your hands (that’s what I do!). Evenly sprinkle over the sugar followed by the cinnamon. Slice the dough ‘sausage’ into evenly sized slices and lay flat on the prepared baking sheets leaving plenty of room between them to spread. Cover with clingfilm or tea towels and leave to prove for about 45 minutes. Preheat the oven to 190ºC / 375º F / gas 5. Once the buns have plumped up, bake them for around 10 – 15 minutes (depending on how thick the buns are), they should be risen and golden. Once cold, make the icing by sifting the icing sugar into a bowl and adding just enough orange juice to make a paste thin enough to drizzle. Drizzle over the cooled buns and stick the sugar snowflakes prettily to the icing. 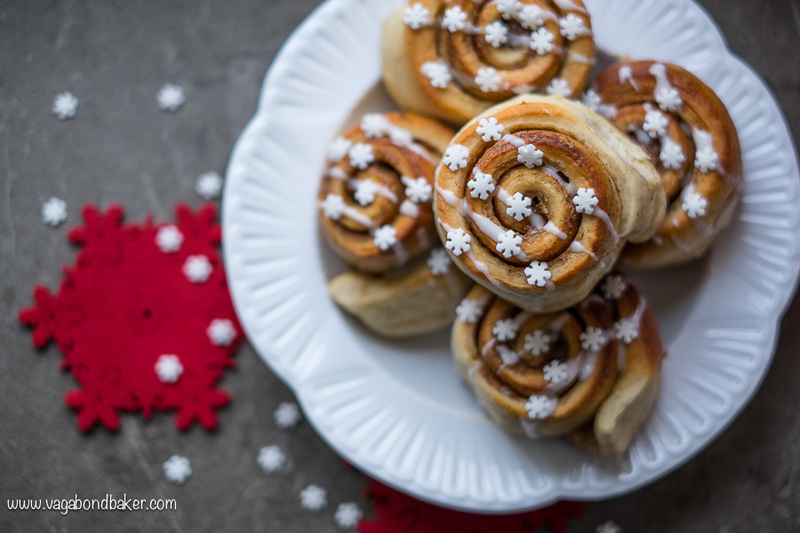 Cinnamon Rolls dusted with snow flakes. Place into a clean bowl, cover with cling or a tea towel and leave to prove for around an hour, it should double in size. Leave it somewhere draft-free and not too cold. Cover the rolled out dough with the soft butter, spreading it out evenly with the back of a metal spoon. Evenly sprinkle over the sugar followed by the cinnamon. Slice the dough 'sausage' into evenly sized sliced and lay flat on the prepared baking sheets leaving plenty of room between them to spread. Once the buns have plumped up, bake them for around 10 - 15 minutes (depending on how thick the buns are), they should be risen and golden. Drizzle over the cooled buns and stick the sugar snowflakes to the icing. Freeze un-iced and reheat in a hot oven for 5 to 10 minutes. Gingerbread Reindeer Cookies cute and leaping with festive joy! 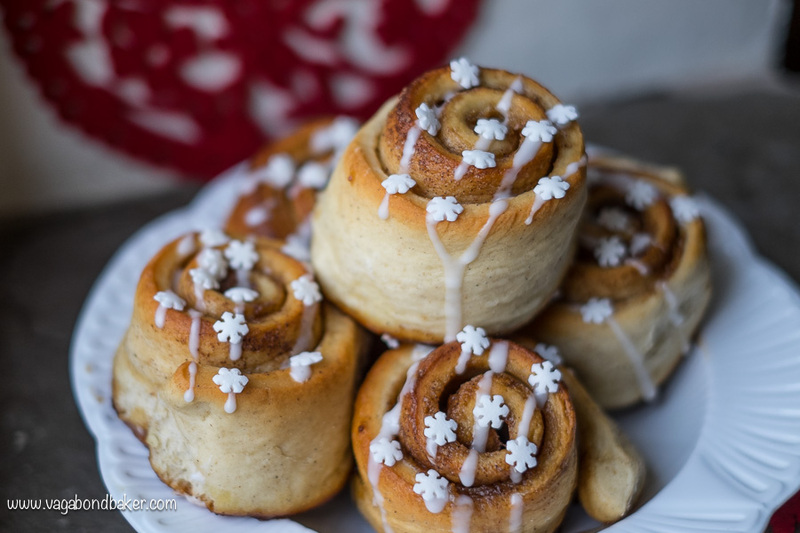 Korvapuustit Finnish cinnamon rolls – rolled up a whole different way! Sunday Musings: Vegan Spiked Mince Pies mince pies get a wee bit drunk and vegan! How much do you love cinnamon rolls? You made some delicious foodies,i like your buns,that looks mouth watering,really thanks for sharing some tasty recipes.. Gorgeous!!! Merry Christmas Rachel! Happy Travels! Hope you had a great Christmas Mimi! Why do I get the feeling you’re going to have a lot if visitors popping around now? 😉 These look fab! Hehe! Thanks Emily! We actually didn’t have many in the end, stuffly colds and flooding kept a few people at bay! I love cinnamon buns A LOT, in fact I made some on Friday! They just say Christmas to me. Loving the snowflakes on top! Thanks Kerry! 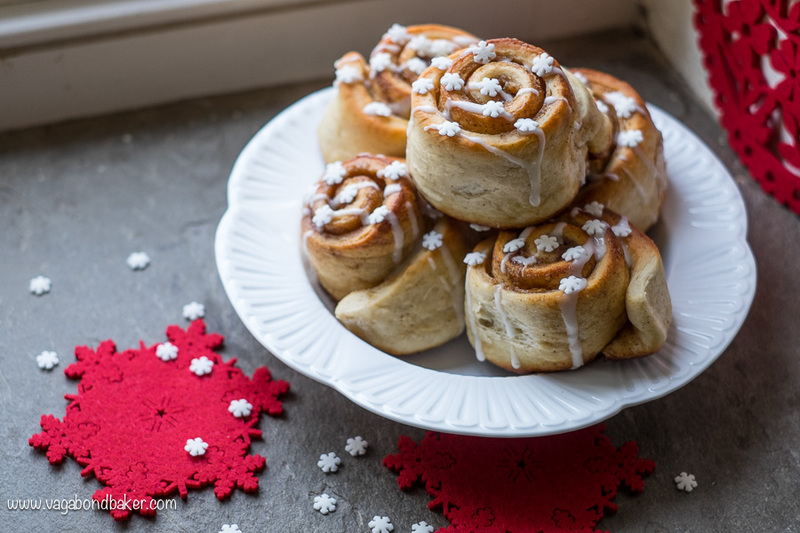 Cinnamon rolls rock the world! I eat them throughout the year with my Nordic fascination, but it felt perfect timing to bake a batch for Christmas. I saw the snowflakes and knew exactly where I was going to scatter them!